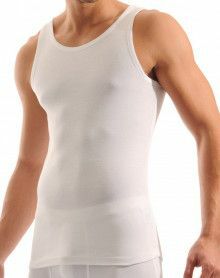 There are numerous forms of tank top for men among big brands of underwear. 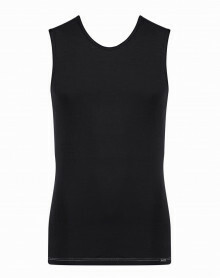 Classic man tank tops that are used as underwear and are offered by brands like EMINENCE, HOM or IMPETUS. Tank tops with trendy forms to wear as close-fitting ready-made. Big international brands like EMPORIO ARMANI, DIESEL or even CALVIN KLEIN offer tank tops in comfortable materials in a "ready-made'" style. Tank tops There are 22 products. This Impetus tank top offer a very nice 100% mercerized cotton material. This blue T-shirt IMPETUS is the ideal technical underwear to surpass themselves. This Eminence tank top is 100% cotton of Egypt. This matter of appellation of origin provides smoothness, freshness, strength and shine. (100% Egyptian cotton). The tank top is a sleeveless underwear, with straps, neckline in front and behind. It offers great freedom of movement. Made of cotton, this garment offers great comfort. A tank top can be worn every day, as an underwear or as a full-fledged garment. Depending on the shape you want, you can choose between HOM, EMINENCE, IMPETUS or ARMANI brands.